Day 3: Tuesday-- My first day back at work!! 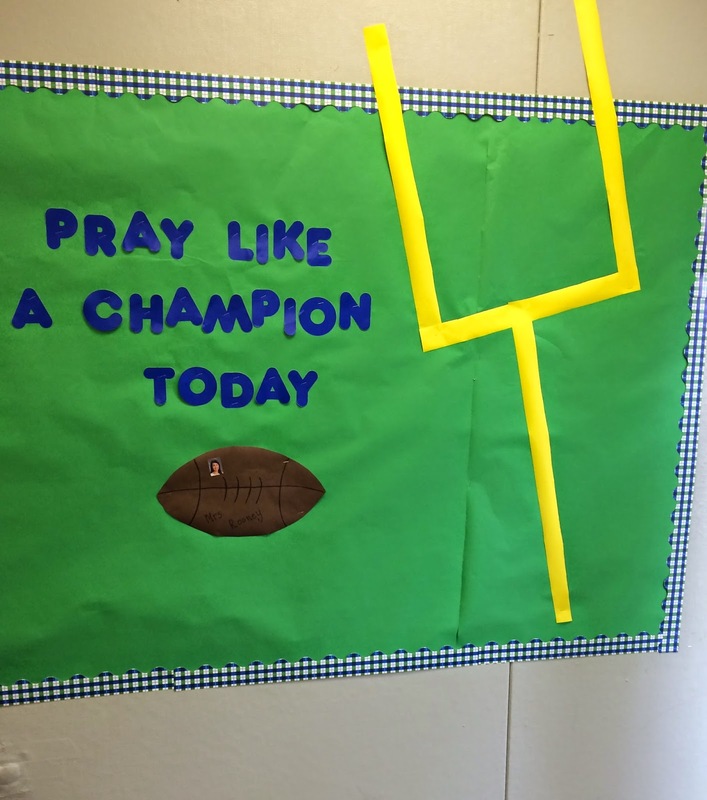 I worked on my bulletin board and theme for the year which is a spin-off on the famous Notre Dame football quote, "PLAY Like a Champion Today." This year I'm going to have the kiddos decorate footballs with their pictures on them to put up on this board. I seriously love my job!! Day 4: Wednesday--Today was the first day it was just Sarah and I! We missed Brookey and Buddy!!! We filled the time with lots of errands and then we made this amazing Pumpkin Gooey Goodness cake! (I don't have a better name for it!!) The kids were so excited when they came home to this awesome after school treat!! Day 5: Thursday--For much of the summer, Brookey and Buddy decided to share a bed. It was super cute...they would go to bed and talk and giggle and laugh for sometimes an hour before going to sleep. A few weeks ago, Brookey decided to move back into her own bunk. Well, ever since the earthquake they are back to sharing a bed again! Brookey said she's not taking any chances with the top bunk! LOL! It's really cute :) I love how they are clearly divided (Tinkerbell and Spiderman), separated by the giant ducky. LOVE THESE TWO!!! Have a great week! 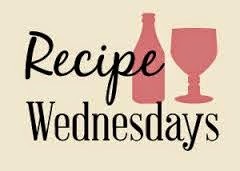 See you back here Wednesday for Recipe Wednesday!! To kick off the start of the college football season this week, I have an amazing dip recipe for you! For some reason, football season and dip go hand-in-hand in my book. 2. Fry bacon until golden brown, drain on paper towels. 3. 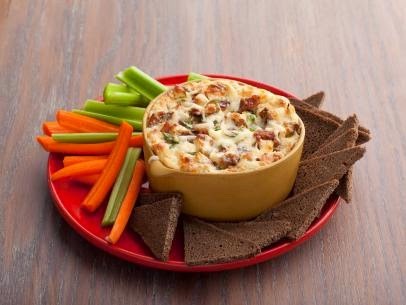 In a mixing bowl, combine cream cheese, mayo, mustard, horseradish, 1 cup of the cheese and cooked bacon. **You can make this a day in advance and bake it right before you are ready to serve. You can serve this with bread cubes (i.e. sourdough) or veggies like the picture above. 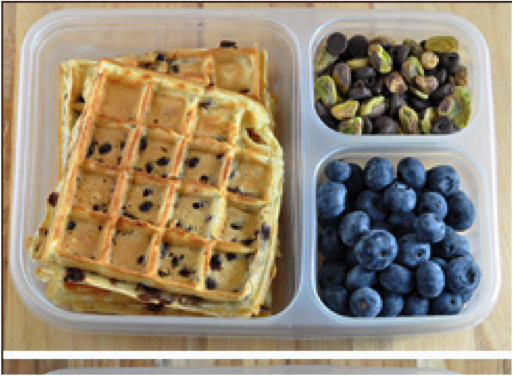 My favorite thing to dip with this however are Wheat Thins or pita chips! Even if you **think** you don't like Swiss cheese or horseradish, give this a try! It's sooooo good! 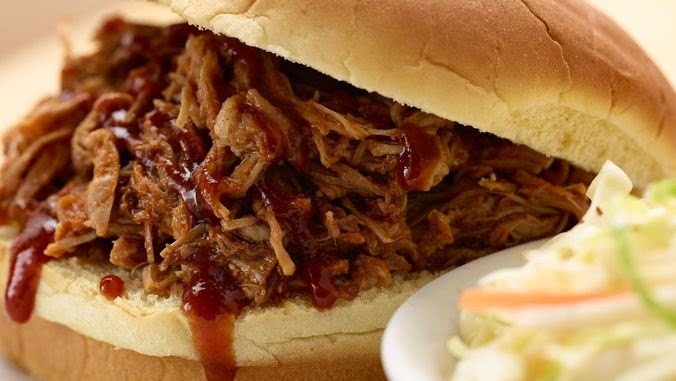 Recipe Wednesday: The Crock Pot and the Best Pulled Pork Ever! 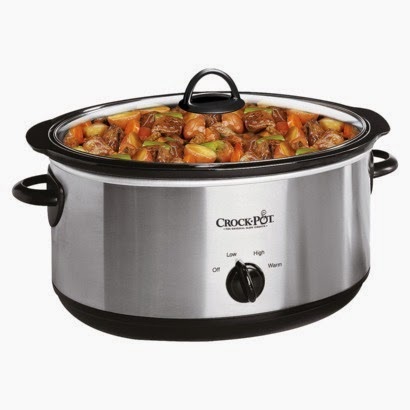 Do you own a crockpot? If the answer is no, you need one. Like, now. 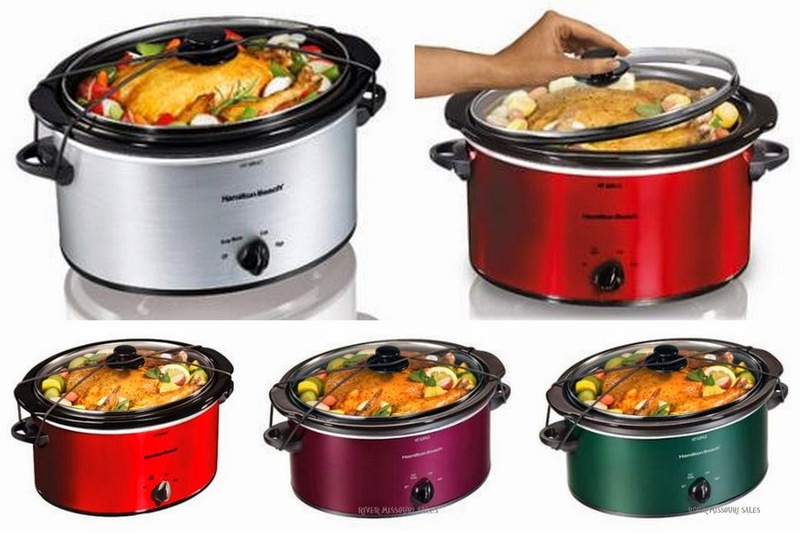 They are pretty cheap and once you learn a few recipes and get into the habit of using it, it will be one of your most valuable kitchen items. 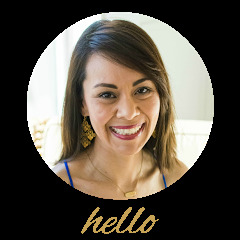 The 2 recipes I'm going to share today ALONE are reasons enough to get a crockpot. I'm serious. They are THAT good. The pulled pork recipe has a 2 minute prep time..and that includes washing the knife you used to prep. How good does that sound for a busy weeknight??? 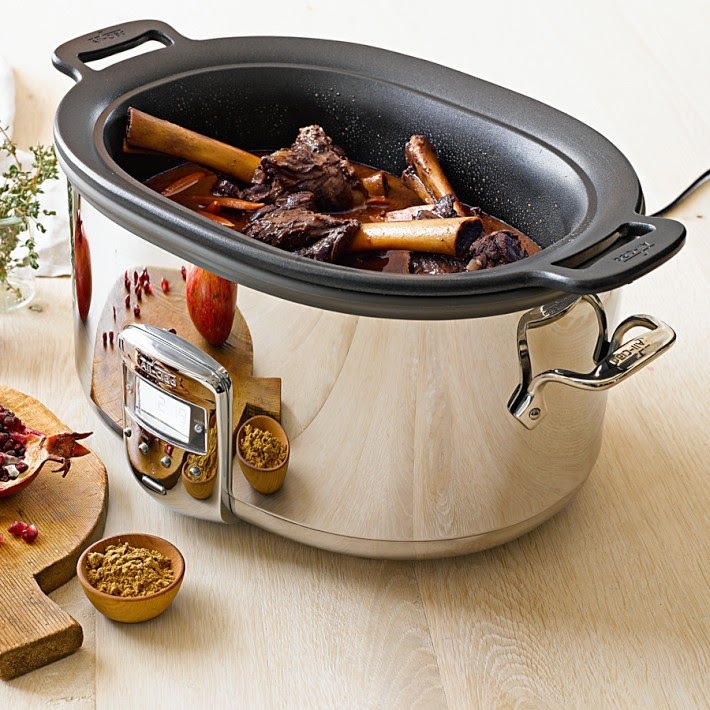 Or go for broke and get this one from Williams Sonoma for $249. Wow, whatever is cooking in there looks AMAZING!! I'd eat that--bones and all. 2. Place chopped onions into the bottom of the slow cooker. 3. Place pork on top of onions and pour both cans of soda into the slow cooker. 4. Cook on HIGH for 7-8 hours or on LOW for 10-12 hours. Pork should be falling apart when you touch it with a fork. 5. After cooking, carefully remove pork from crockpot. Drain all liquid and onions from the pot; discard. 6. With two forks, shred the pork until it is fine and there are no big "chunks" left. 7. Return shredded pork to the crockpot and stir in the BBQ sauce. **here you can taste and decide whether or not you like more or less sauce. I tend to like it more "pork-y" and less "sauce-y" but that's just me :-). 8. You can stir in your scallions and serve immediately OR set the pot on low or the "keep warm" setting and serve in a hour or so. Scallions, sour cream and pico de gallo or fresh salsa for topping! 1. In a small saucepan, heat pork until warm. 2. While pork is heating up, spread tortilla chips in an even layer on a rimmed baking sheet. 4. Place into a 425 degree oven for about 3-5 minutes until cheese is melted. 5. Top with scallions, sour cream and fresh salsa. OMG. YUM. YUM. YUM! If you have never tried pulled pork nachos, you need to put it on your bucket list. Seriously. 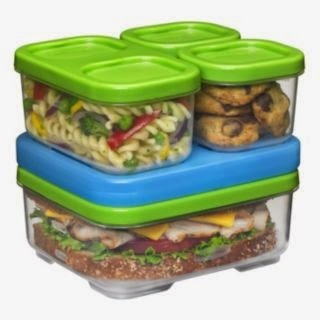 You could even serve this to your friends and they'd never know you were feeding them leftovers! LOL! Just like I knew it would, summer went by soooo quickly! I have to admit, though that everyone (myself) included is excited to get back to school and start a routine again...as crazy as it gets sometimes! I started the Summer Challenge 10 weeks ago with the hopes that we would make the very most of each and every day of our precious summer. And frankly, so **I**, personally would make an effort to enjoy each and every day with my precious little ones who are growing up too quickly. 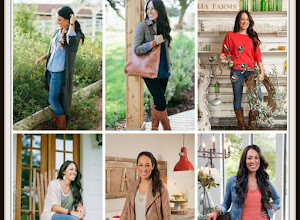 Looking back at all the pictures, I think we did an awesome job at making the most of our 10 weeks. We hiked, we baked, we camped, we scootered, we swam, we ate Popsicles, we danced, we sang, we got Slurpees, we hung out with old friends, we made new friends, we rode trains, we went to the fair, we shed a few tears leaving my dad's old house, we played with cousins, we ran through vineyards, we witnessed a beautiful wedding. Most of all we laughed...a lot. Yep, it was a wonderful and exhausting summer! Day 1: Sunday-- Beautiful day for a family pool day! It's rare that Daddy comes with us! The weather was perfect but when we arrived at the pool, we were the only ones there! Score!!! Day 2: Monday--What a lazy, lazy day. I swear, no one wanted to do anything!!! We kinda just hung out all day, then around 3:30 decided to take a walk to get out of the house. I think this is what they mean by the dog days of summer. Sarah with her bike helmet on :) She wanted to hold my hand while we walked which was very rare for her! Day 4: Wednesday--It was off to Costco to stock up on some school lunch items. 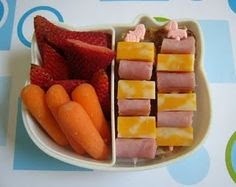 As you know, I'm new to making lunch for the kids to take to school! I let Brooke and Will choose a few things they wanted for their lunch. They chose Danimals, Nutri Grain Bars, Fruit Cups and Sun Chips! Day 5: Thursday--At our house Pizza Night is ALWAYS Friday!! However, since I had to work all day today I changed it up and had pizza night THURSDAY! Crazy! LOL! They loved it, clearly. Day 6: Friday--We went to Fenton's for the best french fries, crab salad and ice cream!! Sooooo yummy--i don't think there was a crumb of food left. Well, that wraps up the Rooney Summer Challenge of 2014! What a fun summer!!! 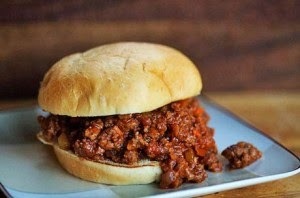 See ya back here Wednesday for Recipe Wednesday for the best, easiest recipe ever created. And of course, regular Seven on Sunday next Sunday!! I have a confession to make. 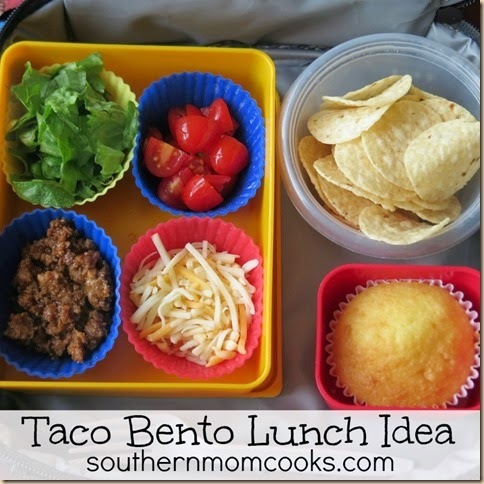 I've never made a brown-bag, packed, school lunch for my kids. 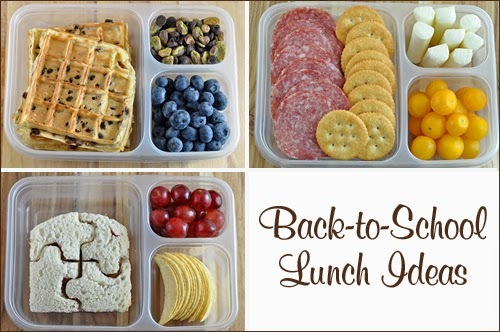 Ok, ok, I am **slightly** exaggerating....i did make lunch for Will in preschool 3x a week last year but it was ALWAYS the exact.same.thing: jelly sandwich, crackers, yogurt, cereal bar. Every.single.day. It was brainless and an afterthought. Well, two big things have happened this year...#1 School lunch prices skyrocketed from $1 (teacher discount!) to a whopping $5.70 (#teachersgetnorespect)!!! !Soooooo...Brookey will not be able to indulge in school hot lunch every day as she has the past 3 years. 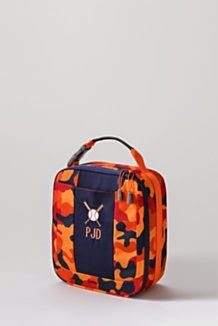 #2 Will has been branching out a little with his food choices so he will consider things other than the dreaded jelly sandwich. Really, people?? Who did this??? I want to know who it is because I want to be their friend. Because as their friend, I would tell them how ridiculous they are and after that, I would **strongly** suggest some additional hobbies to fill their time so they are not spending their time making cantaloupe hearts. 2) "Main Courses:" I scoured Pinterest for some "main course" ideas outside of the typical sandwich (which will STILL be on the menu, of course!). 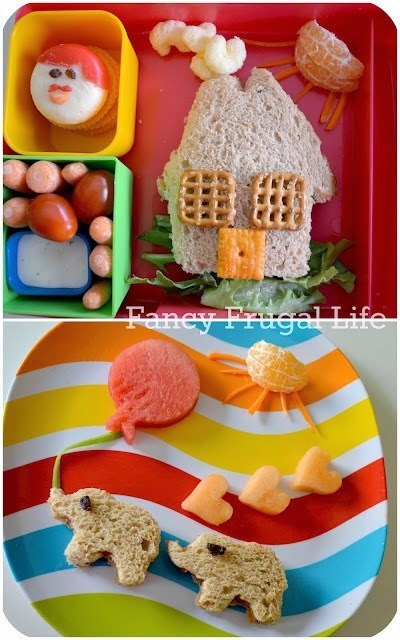 Here is a list of what I came up with...these are things my kids will eat..if your kiddos are more adventurous eaters then there are so many more options! - Mini bagels with cream cheese/jelly/honey, etc. 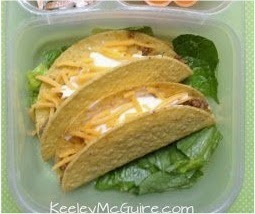 - Tacos! You could also just use those "Scoop" chips and put whatever "toppings" on the side. You can see that you can make tons of combinations with just a handful of items. This "brainstorming" and list-making will definitely help me all year long, as I venture into the world of lunch making. I hope it will help you, too! 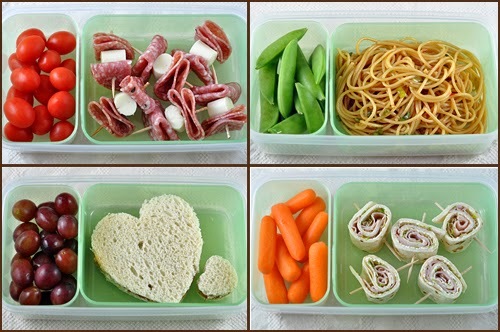 I'll leave you with a few more pictures of simple lunches that will hopefully get you inspired for the school year. 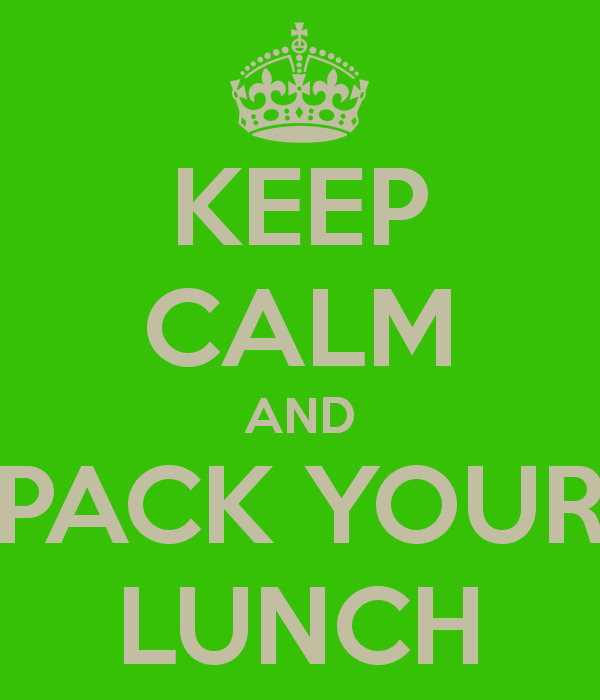 Happy lunch-packing! Seven on Sunday: Summer Challenge Week 9! Well, we're nearing the END of summer. The kiddos go back to school Monday, August 25th so we are trying to make the most of each day! I think we've done well with our Summer Challenge! 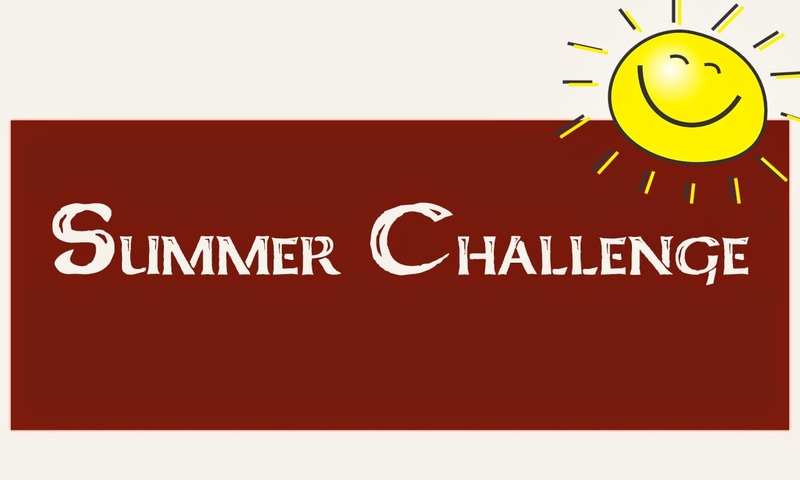 Remember, the Summer Challenge was to try to do something fun, together as a family each day. I think we've succeeded almost every day with a small handful of exceptions (this week being one of them!). Last week, the wedding excitement was over, but we still had the pleasure of my brother in law and his family staying with us for a few extra days. We tried to make the most of it! The rest of the week we were busy getting ready for school to start! Day 2: Monday--Scott took the day off on Monday and it was a gorgeous day to head up to Sonoma. The beautiful view from from Domaine Carneros. Why is Will holding on for dear life??!! Day 3: Tuesday--Tuesday was a sad, sad day :( Everyone flew home to Indiana, Scott went back to work and it was just me and the kids home all alone. We decided to get out of the house and go school and soccer-shoe shopping. Ugh..17 stores later, we ended up with 8 pairs of shoes (lots of Buy 1, Get 1 for 50% off deals!) :) On a nicer note, here is Sarah spending a little quality time with Baby Emily before she left. Day 4: Wednesday--School supply shopping. Ugh. Need I say more? I decided next year I am going to take each of the kids individually so they can actually ENJOY the experience. Today WAS NOT enjoyable!! One more week of the Summer Challenge left and I intend the make the most of it!! Cheers to a great week!! Ok, today is a two-fer. 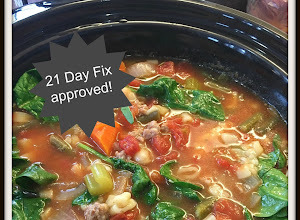 A recipe AND I'll also share how I do my meal planning. 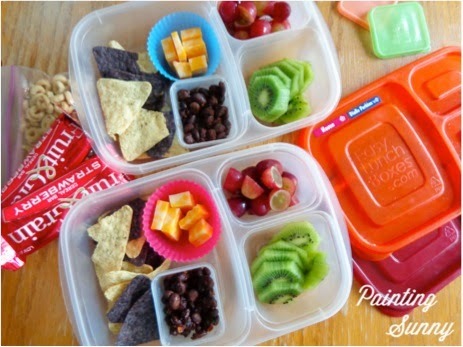 With back-to-school upon us, it's more important than ever to start meal planning. I plan out my meals every single week. 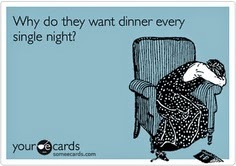 That's just how I am--i cannot imagine going through the day without knowing what's for dinner. Me: Honey, what do you want for dinner next week? Scott: I have no idea. I'm good with anything. Me: Seriously??!! 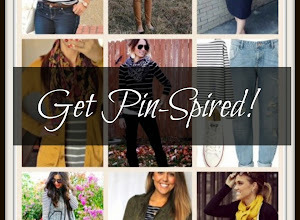 Give me some ideas! Scott: Ok, what about pasta? Me: Brookey, what do you want for dinner next week? Brookey: I don't know. Pasta? Me: Buddy, what do you want for dinner next week? I also look at our calendar for the following week and see what's planned in the evening. If it's a soccer night, I'll do something that can be reheated because we all get home at different times. If I work that day, I'll do something I can make in 30 minutes or less. And that's it!! Pretty simple! Each night before I go to bed, I check the fridge menu and see if there is anything I need to take out of the freezer. I usually make one mid week trip to the grocery store, too...to get fresh veggies or more milk, etc. We're always running out of something and I'm always forgetting something! 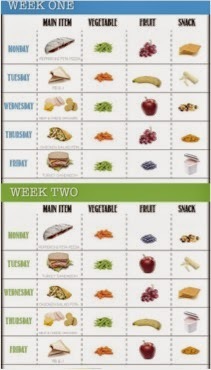 But I'm telling you, taking 15-20 minutes meal plan each week is a saving grace, especially during the school year. 1. Brown meat in a large skillet until just cooked through; add onions and green pepper and cook until veggies begin to soften. 2. Add in remaining ingredients and simmer for about 5-10 minutes, until flavors are combined. 3. Taste and adjust seasonings. This is the fun part...i like my sloppy joes slightly sweet (more brown sugar), but some prefer them more savory (less sugar, maybe more mustard). 4. Spoon mixture onto toasted buns. - Serve meat mixture over fries and top with cheese for a chili cheese fries-like meal!! - Cut a baguette in half lengthwise, top with the meat mixture and cheese; put in the oven for about 5-10 minutes until cheese is bubbly...a great open-faced option. Seven on Sunday: Summer Challenge Week 8! Wow! What a week! Family, friends, food, laughter, tears and a wedding!!!! Here we go! Day 2: Monday-- More fun with Aunties! Let's just say it was the funniest game of Uno ever! Day 3: Tuesday--What a DAY!! We headed up to Napa for my sister in law's wedding and all the cousins were reunited! They were in heaven!! Here they are running through the vineyards! Day 4: Wednesday--Rehearsal dinner day! Look at all the cousins! Ages 5 months to 21 years. I love these kids so much it hurts! This is their "silly face" pic. Day 5: Thursday-- WEDDING DAY! Omg, too many cute pics to post, but here's me and my love :) #selfie! I'll post more wedding pics soon. Day 6: Friday--Wedding excitement was over today and we headed back home. We took my sis in law to the ferry and we took a 3 "sister in laws of the Rooney family photo!!!" Love these girls! Day 7: Saturday--On Saturday, we hung out in SF and had one last day with the wedding couple before they went home. What a great week! More wedding pics to come soon! Seven on Sunday Summer Challenge: Week 7!